The contemporary, minimal design of these earrings will appeal to those who like a simple yet trendy style. The chain connects the bottom of the bar to the earring back and dangles freely. Delivered in a beautiful gift box, these earrings make the perfect gift for any occasion. 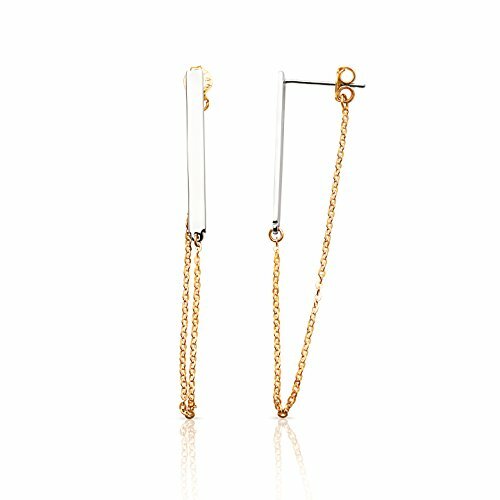 ★GOLD FOR GOOD: Made from 14K yellow and white gold, these Bar Earrings with Stylish Dangling Chain earrings are perfectly suited for women and girls. This trendy design will add flair to any outfit. ★SPECIAL PACKAGING: These dangle earrings come in a Gift Box, so whether for you or a friend, the sparkling dangle earrings arrive in a package appropriate to their style. ★NOT JUST GOLD: While the solid 14k yellow gold is impressive on its own, the white gold will dazzle all making these earrings perfectly suited for day or evening wear. ★THERE IS NO WAIT: Delivered FAST, these textured Bar Earrings with Stylish Dangling Chain earrings get to you quickly so you can start wearing them when and where you want.